Better, more generous games are emerging from the shadow of Call of Duty. They don't make them like they used to. This is a sentiment that haunts modern mainstream games, particularly shooters, particularly for hobbyist and value-conscious players who have seen PC gaming change in a million ways over the course of the last decade. The FPS, the most mainstream gaming proposition that exists outside of a browser window or touchscreen, has been at the forefront of a series of sudden evolutionary shifts. Shooters have always been popular, but their popularity was traditionally highest among people who play a lot of videogames. Players willing to invest in powerful PCs were the target audience for the most technologically ambitious games of the nineties or early noughties: those who would buy dedicated graphics cards to get the most out of Half-Life or later Crysis, who would spend big on broadband in the years before the mass acceptance of the tech to improve their performance in Quake or Tribes. This was the hobbyist genre, in that sense and many more. Studios like Splash Damage were born out of modding teams that themselves were given life by developer tools shipped with first person shooters. Storytellers cut their teeth on immersive sims that permitted newly cinematic modes of expression, establishing principles both technological and narratological that would branch out to touch everything from Modern Warfare to Alien: Isolation and Gone Home. The smaller, more specialist audience of that time imposed mutually agreed-upon standards on developers and publishers: games were expensive physical boxes expected to contain stories, multiplayer, tools, LAN supports, bots, and so on. Proportions varied, of course, but these were the expectations and that was the genre. Until suddenly it wasn't; until Call of Duty led the shooter's explosive charge into the cultural mainstream. Fast forward almost ten years and shooters exist in tiered strata not unlike pop music or movies or young adult novels. Call of Duty and to a lesser extent Battlefield have achieved a level of cultural penetration equal only to FIFA, Madden, handheld and browser games—and to an extent their achievement is more impressive because they do not have the broad recognisability of traditional sport nor the vast userbase of mobile phones to draw upon. They have achieved that peculiar degree of popularity where for many people they simply are. You've got your PlayStation for Netflix and each year you buy the new Call of Duty because your friends are playing it. It might be good this time or it might not, but you complain about it like you'd complain about the weather. Children rush home and demand it from their parents because everyone else at school is playing it. It becomes the only game that those parents consider because it's the only thing that their children are talking about it. When the store attendant lets them know that they're also going to need a season pass and some Infinite Warfare controller stickers and some vouchers for in-game currency they reach into their pockets because the last thing was Avengers (again) and the next thing is going to be Star Wars (again) and that's just what it is to provide and consume entertainment in 2016. That is what growth from subculture to mainstream looks like—what it has always looked like—and the anxiety that this has caused among enthusiast game-players is not unique to them. Publishers have discovered that they can offer far less for far more as long as they spend enough on marketing. And that complaint—they don't make them like they used to—starts to seem a little trite, because of course they don't. If you were an executive at EA, and you knew that you could charge $130 for a version of Battlefield 1 that includes all future maps and modes—updates players used to expect for free—and a load of skins—changes players used to expect to be able to make for themselves—why wouldn't you? They'd be insane to do anything else. Click here to read our review of Titanfall 2, one of the surprise hits of the year. Were it less prohibitively expensive and not bound to Origin then they'd have completely nailed it. 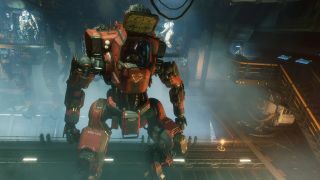 But even so, Titanfall 2 marks an unexpected shift in the otherwise grim trajectory of this part of the games industry, a gamble on quality and generosity in what often feels like an age of efficiency and paucity. This is notable for EA, but not without precedent elsewhere in the industry. Rainbow 6: Siege was an oddity for Ubisoft, a company that seemed to have invested itself wholesale in the production of annualised open worlds but made an exception to produce one of the year's best and smartest tactical multiplayer shooters. Similarly Bethesda, which has successfully supported talent at id, Arkane and Machine Games and in doing so profited from the critical acclaim bestowed upon Doom, Dishonored, and Wolfenstein: The New Order. Seen in this light, EA's totally divergent strategies for its two shooters seems less erroneous. What I think we're seeing is the waning influence of the Call of Duty bandwagon. That particular ship hasn't just sailed: like the photogenic twenty-somethings in Infinite Warfare's cringeworthy TV spot, it has rocketed off into space. You can't beat Call of Duty or Battlefield by mimicking their business models: in fact, without the degree of mainstream acceptance that lets them get away with it, doing so is a good way to kill a game. Just ask Evolve—hell, ask Titanfall 1. It makes more sense to build something good and try to foster goodwill around it—and to foster development talent, too. As people who care about these games (or care enough to complain about the way things are, at least) this provides a reason to be optimistic. Battlefield happens to be good this year, as Call of Duty may well prove to be. But there's going to be no changing the nature or the borderline-exploitative value proposition they present to prospective players. Until the public gets bored of them, they're not going to change. It is time to start worrying less about how the sales of games like Titanfall 2 match up against the genre giants that they can't hope to usurp, and to start appreciating that we've entered an era where an alternative approach is being experimented with. If you bemoan the rise of pre-order bonuses, microtransactions and season passes, do not buy them just because. If you're going to invest yourself in mainstream games, choose the ones that meet your standards and respect your expectations. If your complaint is that they do not make these games like they used to, then it is on you to show up when they do.